Home Halo Ambassadors Halo Ambassador – Meet Haliegh Townsend Return to Previous Page. Hi, my name is Haliegh Townsend, I am 17 years old and have been showing in the hunter/jumpers, and equitation since I was 7. My love for riding led me to Just World International, a non-profit organization seeking to better the lives of those living in developing countries through the equestrian community. I became an ambassador only about two years ago, but I love to host bake sales and other fundraising initiatives to benefit this charitable organization. If you would like to learn more or donate, please visit their website:www.justworldinternational.org. When I am not fundraising for JustWorld at a show, I can be found on horseback. Although I have experience in all three arenas, I have an uncanny need for speed that is best satisfied by the jumper ring. I am currently showing my Dutch Warmblood gelding, Mr. Worldwide, in the high children’s jumpers 1.10-1.15. We are ranked in the top 5 in the zone standings. Occasionally, Mr. Worldwide and I also dabble in the big equitation and medals. I personally love the equitation ring. I enjoy the grace and quick-thinking that goes into a beautiful round. 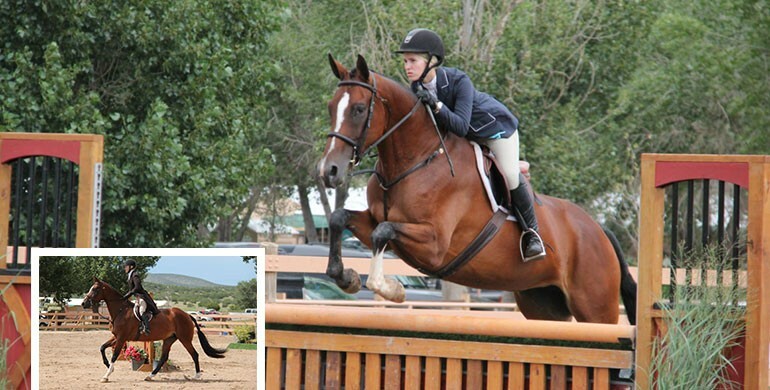 The finesse I have learned in the equitation has helped me in the hunters. I am currently working with a young hunter prospect named West Hollywood. Just this year I have begun to show her in the Children’s Hunters, but am hoping that someday she will make a great Derby horse. I am excited to continue competing with these mounts at shows across the West Coast this year. In addition to showing my own horses, and those owned by Halo Horses LLC, I ride in IEA, a relatively new program similar to collegiate riding (i.e. you don’t ride your own horse). I ride on the Crossroads East Valley IEA Team, and have been a Varsity Open Over Fences and Flat rider for the past three years. Despite my busy schedule, I still make time for school, because a good education is very important. I take mostly AP classes, am working on becoming bilingual in Spanish, and should be graduating early, at the top of my class, and with a GPA of 4.5. My long term goals include majoring in Biochemical Engineering, riding on a collegiate team, and eventually saving up enough money to open up my own stable. Overall, I know that if I work hard, I will get results. I am excited to be an official Ambassador for Halo Horses LLC!